Interestingly, the Toronto beach loft you’re about to explore began as a two-story Italian restaurant, which was purchased by the current owners with aspirations of converting the space into a functional work and living space. The main floor was designed as a space to run a business, with the second floor offering a quiet respite with all of the other living functions of a home. Colourful and creative, the second floor “oasis” of this beach loft has been converted by the interior designers at Collage Designs into an upbeat space infused with a playful personality. Fresh, clean, and filled with pops of bold colours, the resident enjoys a cheerful environment characterized by deep purples, rich magentas, soft blues, and perky pinks—and there are a few spunky, unexpected colour schemes waiting to surprise you in the bathroom and bedroom as well! As the second floor of the loft, this area houses all of the primary functional living spaces of a home on one floor, many of them visible in this communicative open layout. Upon entrance, you immediately notice the liveliness infused into the home’s atmosphere, with bright colours bathing in an abundance of natural light. 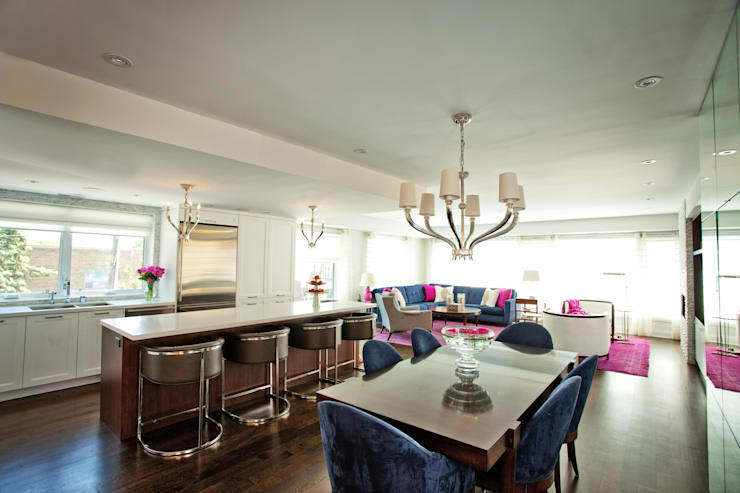 Dark hardwood floors ground the space; above, eyes are drawn to the elegant curves and sparkling crystals of the suspended light fixtures, elevating the space with feelings of sophistication and regality. Immediately upon entrance, the dining room leaves guests with an elegant impression. Not only does this arrangement include highly unusual purple upholstery, but it’s manifested in a plush velvet that emphasizes purple’s already-majestic undertones. Neutrals provide an excellent stage for this bold colour scheme to work its magic in the living room area! Exciting splashes decorate the floors and furniture, while light and neutral walls give appropriate breathing space for these attention-grabbing hues. This open common area is well-designed for hosting social gatherings, offering different arrangements to suit different occasions, distinguished by subtle cues like separate area rugs or slight shifts in colour scheme. 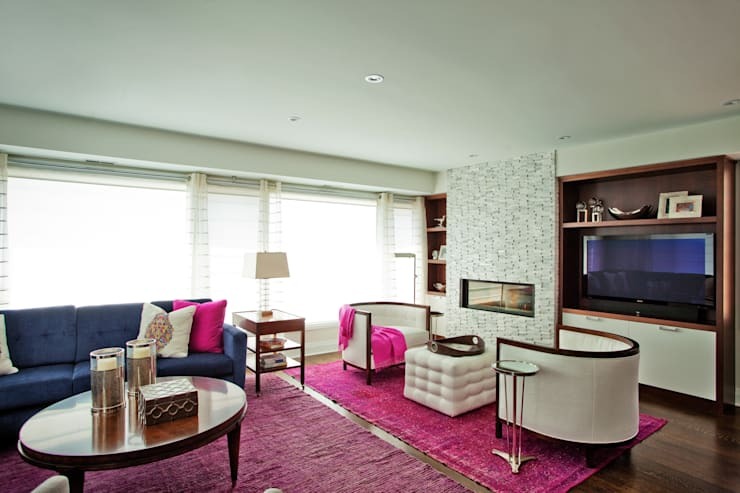 The influence of Art Deco is subtle, yet it’s undeniable: from the curved furniture to the decorative artifacts of silver and glass, this room’s aesthetic gets inspiration from late Art Deco, with an early mid century mod aesthetic infused into the room’s pink rug and wooden trim. The kitchen keeps things simple, leaving the bright colours behind for a more utilitarian workspace. 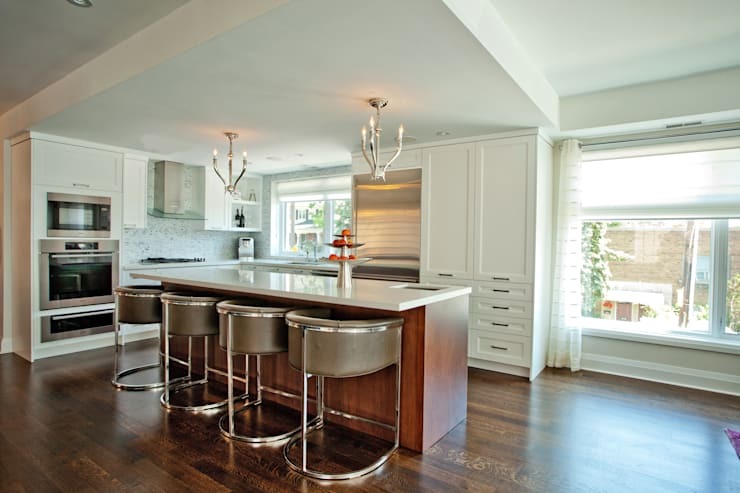 Art Deco sneaks into the chairs of the kitchen as well, making a polished statement with their reflective metal frames. The bathroom glows brilliantly in all white, with marble floors adding their smooth, silky richness to the room’s airy aesthetic. A crystal chandelier serves as an echo of the decadent exuberance of the rest of the home, while the glass shower, white walls, and abundance of natural light turns the room into the a vision of cleanliness. A surprising burst of citron greets the eye in this energetic bedroom, found not only in the curtains, but in the floor, pillows, and wall art as well! 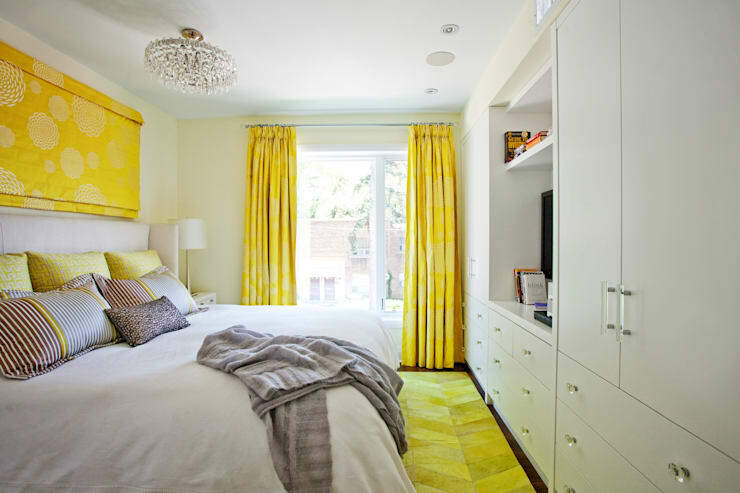 Contributing a sense of positive energy, clarity, and optimism, yellow isn’t a conventional colour for a restful bedroom space—instead of aiding in relaxation, this room’s colour scheme celebrates the morning sunshine by greeting the day with a sense of enthusiasm and verve! Tour another personality-filled home in this ideabook, featuring an award-wining brick home with unique decor! 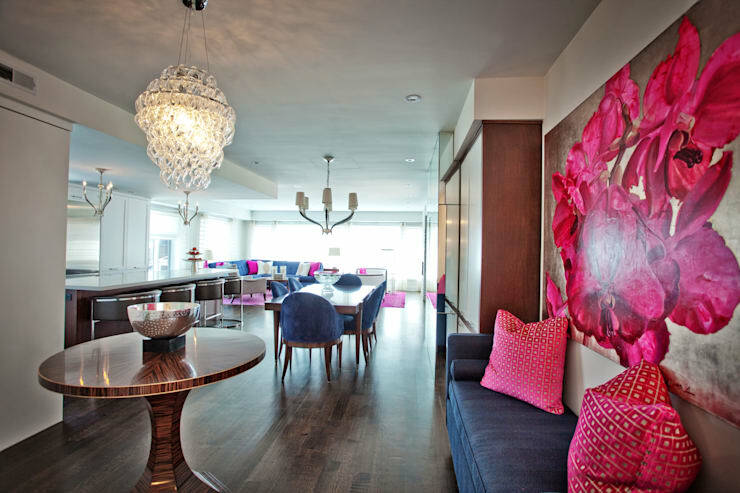 Share your comments on this colourful interior design below!